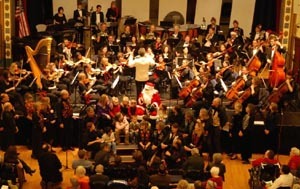 Home > Events > Music & Concerts > Lexington Symphony's Holiday POPS! Official Website: Lexington Symphony's Holiday POPS! Sing along and celebrate the season with Lexington Symphony! Suited for families with children of all ages, the 4 p.m.
Holiday POPS! concert features popular holiday tunes, including 'How the Grinch Stole Christmas,' 'Harry Potter,' 'Polar Express,' and 'Frosty the Snowman,' as well as sing-alongs, and a special visitor from the North Pole! The 7:30 p.m. Holiday POPS! concert offers a festive atmosphere and musical favorites that evoke joyous holiday memories, including 'Miracle on 34th Street,' 'A Charlie Brown Christmas,' 'Have Yourself a Merry Little Christmas,' and 'Winter Wonderland.' Don’t miss this cherished holiday tradition in Lexington! Check ArtsBoston for reduced-price tickets.